The driver must be at least 23 years old. The driver must hold a valid driving licence for cars, issued at least one year before renting. The minimum duration of the renting contract is one day (24 hours). Every hours in excess is computed as 1/5 of the daily renting price. b) Liability insurance against material damages to third parties (excluding our vehicles) up to 1.220.000,00 € provided that the accident was not caused by driving under the influence of alcohol or drugs. Damages to third parties are covered by insurance also when inflicted after the theft of the vehicle. Possible damages to the rented vehicle remain full responsibility of the renter. e)	1.200,00 € per i veicoli di categoria L2 - costo aggiuntivo 25 € + VAT/day provided that the damage was not caused by driving under the effect of alcohol or drugs. The renter is responsible of any gasoline expense occurred during the rental period. The vehicles can be picked up or dropped off outside our working hours (9AM to 8PM) at a extra charge of 30 €. 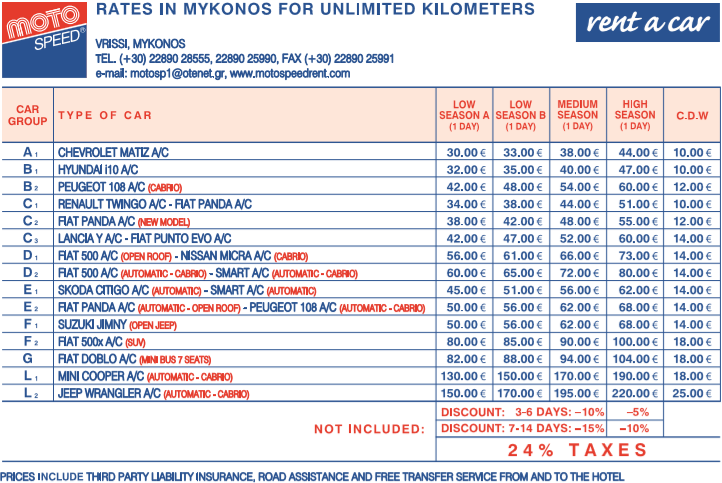 Shipping our vehicles is possible only upon written authorization by Moto Speed S.A.
We are the biggest moto- and car-rental company operating in Mykonos since 1986. We offer free transfer to our customers and road assistance 7/7 during our working hours.